Well, do I need to explain? Really the man is carring a little lamb, is that not the most adorable thing? At first I thought it might be a biblical figure, but honestly I don’t really know a lot about the bible so much. I do like what I see right here. 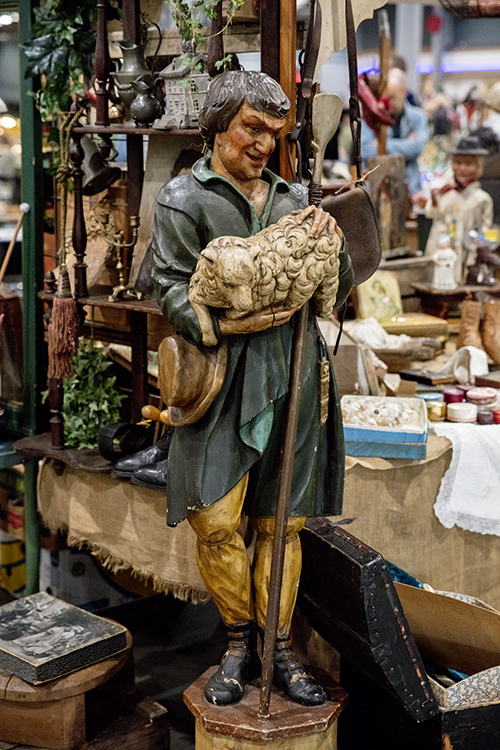 A cheeky guy standing around with a lamb on his arm. Would it be born just a couple of minutes ago? Or is he buying it at the local cattle market? Or is he passing by a friends place and sees this adorable little thing and picks it up to pet it, like we do so often nowadays with puppies and kittens? The statue itselfs is rather handsome as well. Just a little bit scruffed here and there but nothing that does not add charm to the whole. Looking a bit more detailed I wonder what kind of staff he is holding. Would he be the shepherd then? And what is that thing that is hanging on his belt? So many questions that add to the mysery of this man with his lamb. The lamb self seems quite fine with it actually, just enjoying it. Would the clothes of the man reveal more about the age of it then? Yes, it probably does! But secretly I quite enjoy making up my own mind around it, which is exactly why I enjoy these random things I saw! If you happen to have any thoughts of this statue of the man and his lamb, feel free to share it here in the comments. I would love to read your rain of thoughts as well!